Crisp leaves. Golden colors. Cool Days. Warm sweatshirts. Fall is in the air! I love the cool refreshing days of fall! And I love this fall wine cozy! Thanksgiving is my favorite holiday. Family, laughter and relaxation–the things I like best. My mom always makes Thanksgiving dinner and it is amazing. The turkey. The green bean casserole. The sweet potatoes. And the pies. Oh man..the pies. I’ve blessed with a mom who is the most amazing baker. She researches and then perfects everything. She even likes to make sure everyone’s favorites are covered in the pies so sometimes we have more pies than people. I can live with that. I usually make the mashed potatoes. And I have it so easy. My mom peels and cooks the potatoes and I just add the magic (which is evaporated milk and more real butter than is probably healthy). I also almost always bring wine. 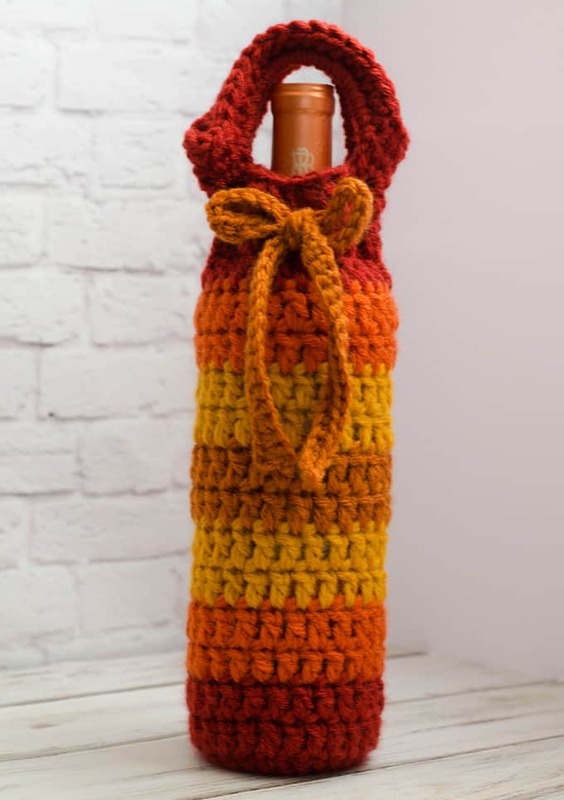 And this year, the wine will be arriving in this beautiful fall crochet wine cozy. I’ve been kind of loving the cozies lately. You may remember the watermelon coffee cup cozy and then the candy corn cup cozy. And now this. The wine cozy. Here’s why I love it: It is easy. It fancies up a bottle of wine and can substitute for a gift bag if you decide to give it as a gift. And you can make it out of scrap yarn, so no extra money to make it. 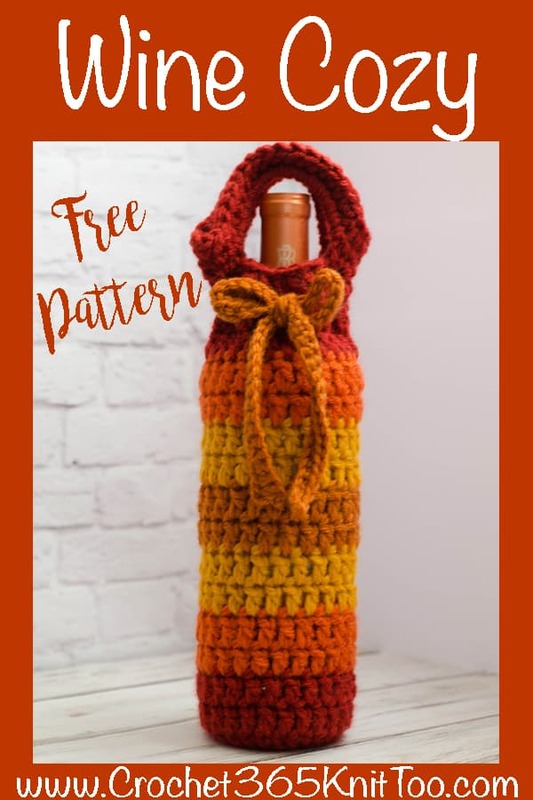 So if you have a free evening, pull out your scrap basket, grab a hook and let’s make this fall crochet wine cozy! Worsted weight yarn in 4 colors. Scrap yarn is perfect. I used Lion Brand’s Vanna’s Choice in Terra Cotta, Rust and Brick and Gold Lion Brand Wool-Ease. R1: Using 2 strands of Brick color yarn, make a magic ring, chain 3 (counts as 1st dc) 11 dc in ring (12 dc total). Sl St to 1st st.
R15-17: With Brick, Ch 3 for 1st stitch, dc in remaining stitches (24 st) Sl st to 1st st.
With Brick, chain 85, sc in 2nd ch from hook and across. Fasten off and weave in ends. Weave tie over and under 2 dc around row 16 and tie into a bow. 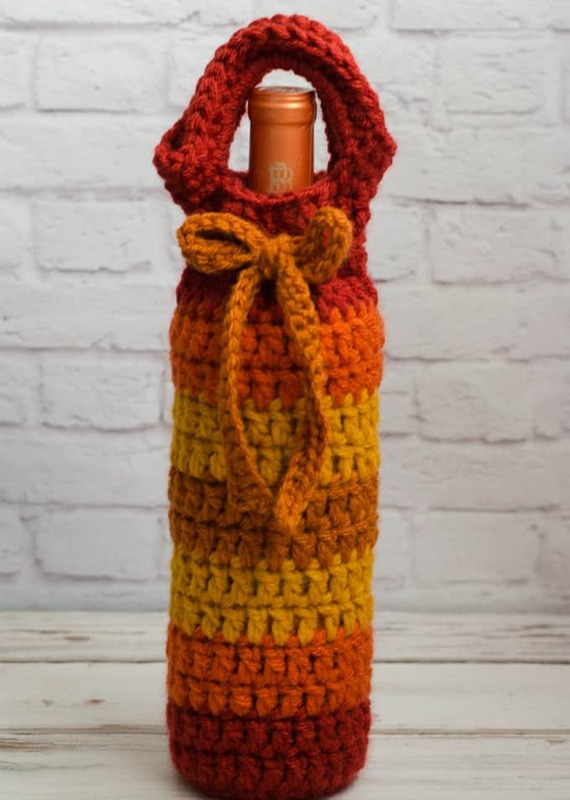 Enjoy a beautiful fall crochet wine cozy for your Thanksgiving table! What is the floral wire for in this pattern? Oops… little typo there. I corrected the list of supplies. I try to save myself a bit of typing by copying and pasting and then just changing the yarn and hook. Must have copied this from the pumpkin pattern. Sorry about that! What does it mean to crochet with 2 strands? Do you have a video? YouTube? It is very easy to crochet with 2 strands. It’s exactly the same as crocheting with 1 strand of yarn, except that you hold 2 strands of yarn together at the same time and then crochet as if you were using 1 strand. Easy Peasy.